The littoral combat ship USS Fort Worth in the South China Sea near the Spratly Islands, with as the PLA Navy guided-missile frigate Yancheng close behind. The United States’ criticisms of China in the South China Sea are misleading — likely intentionally so. The South China Sea issue is back in the headlines again, this time thanks to the reports from Western media that China has deployed a missile system on Woody (Yongxing) Island in the Paracels. The reaction from the United States has revealed a number of oddities and inconsistencies. Overall, there have been numerous claims, discords, critiques, and myths about the South China Sea. But this particular story has exposed at least five obvious confusions in the U.S. strategy and stance in this region. First, a confusion of the Paracels (Xisha) and Spratlys (Nansha). In the past, the international community has mostly focused on disputes involving the Spratly Islands the South China Sea, with China, Vietnam, and the Philippines as the claimants receiving the most attention. Concerns over the so-called “militarization” of the South China Sea are usually raised with regards to the Spratlys. As a matter of fact, China has deployed limited defense measures in the Paracels for decades. Chinese defense capabilities on the Paracels have “nothing to do with militarization,” as China’s Foreign Ministry has clearly stated. Therefore, the missile deployment is not an intentional change to China’s defense posture. The United States seems to intentionally be confusing the Spratlys and the Paracels so as to better denounce China. Third, a confusion of “intention” and “capability.” According to U.S. media, the missiles deployed on Woody Island have a range of 125 miles and pose “a threat to all forms of civilian and military aircraft.” This is another misunderstanding. First, China’s self-defense measures obviously do not necessarily pose a threat to major sea lanes and air passages in this region, unless some incidental “innocent passages” evolve into seriously provocative threats to China’s sovereignty. It is ridiculous to imagine China shooting missiles, unprovoked, at a civilian aircraft. Second, and more broadly, in this situation intention is just as important as capability. The United States maintains the most sophisticated weaponry system, defensive and offensive, ranging across the whole world, while it has constantly claimed to be a force for defending democracy, peace, and order. Why could not the same logic be applied to China? Simply put, capability does not directly pose a threat, but the “wrong” intentions do. As for China’s intentions, the country has put forward a three-point initiative to uphold peace and stability in the South China Sea. China is determined to firmly uphold both “peace and stability” and its sovereign rights, now and in the future. Forth, a confusion of the standards of militarization. The Philippines and Vietnam both “militarized” the islands they occupy long ago, and the U.S. continues to lead joint military exercises and make military sales. In this context, why are China’s self-defense measures labelled as a direct military provocation? This is an obvious double-standard which the United States uses to try to monopolize international discourse. Such a stance seems to tell the world that it is only China’s behaviors in this region that automatically should be linked to militarization. 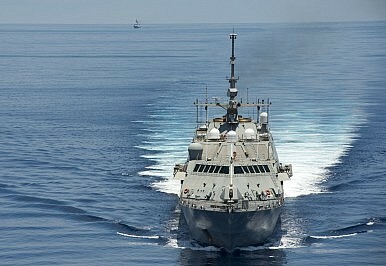 Fifth, confusion about the “freedom of navigation” in the South China Sea. U.S. officials constantly claim their right to protect “freedom of navigation” in the South China Sea. For the past decades, civilian and commercial freedom of navigation in the South China Sea has never been sabotaged by China’s military forces. Instead, it is the U.S. military “freedom of navigation” in the South China Sea that could be limited by China, if it is perceived as a threat to China’s sovereignty. Thus, it is quite convenient for the United States to blame China for this somewhat imaginary “threat” to “freedom of navigation” to gain international support for its military operations in the South China Sea. These generalizations about the South China Sea issue and particularly the intentional simplification of China’s policies and behaviors may win the United States a certain amount of support in this region, but divergences and differences are emerging. For example, ASEAN leaders avoided criticizing China in the joint statement of the U.S.-ASEAN special leaders’ summit. This detail, and what it symbolizes about ASEAN’s stance, is probably of more lasting significance that the media outcry over alleged Chinese missile deployment in the South China Sea. The South China Sea in 2016: What’s Changed? Bonnie Glaser with an overview of the current "facts on the water" in the South China Sea.